Gloria Jean, David LaPlante and Stephen Pounds are All-She-Wrote, an acoustic, harmony folk/Americana group formed in Albany, NY, in 2002 from the duo, LaPlante & Pounds, and singer-songwriter, Gloria Jean. Collectively they have performed all over New York & New England, plus Texas, playing instruments made by David LaPlante, renowned luthier and Martin Guitar expert. Their contribution to the folk circuit are authentically played songs from the 60’s-70’s plus Gloria’s originals, making an enjoyable show of old and new with beautiful three-part harmonies and multiple acoustic guitars. All-She-Wrote has two cds as well as two previous cds from their “solo” days as LaPlante & Pounds and singer-songwriter Gloria Jean. 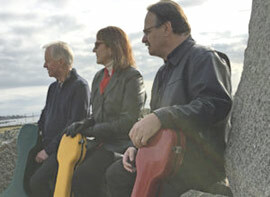 They have a broad repertoire of classic and original folk/Americana developed over decades as musicians. Their interpretations of folk classics pay homage to their roots; and Gloria Jean’s originals reveal a lifetime devoted to the craft of songwriting with a writing style that goes beyond the folk genre. LaPlante & Pounds provide their distinctive complementary finger-picking style to Gloria’s original songs, making these new songs sound classic. They take on love, loss and global warming with beautiful arrangements, intricate guitar work, and warm, rich harmonies. With songwriting influences such as Rosanne Cash and Jimmie Dale Gilmore, with whom she studied; and unusual stories to tell about John Sebastian, Pete Seeger, Peter Paul & Mary, and others they have had the pleasure to meet, this trio provides an interesting and enlightening show.